Social media sharing is a great way to drive traffic, and you'll certainly have more engagement. 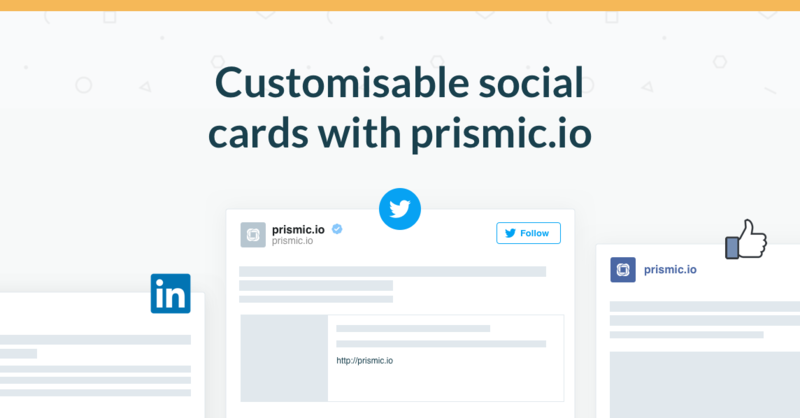 Let's walk through how to set up Social Media Cards to display your content nicely when shared on social media using prismic.io. Our main example will focus on setting up a Twitter Card. You will find examples of other types of Social Cards at the end of this article. We'll make that metadata dynamic, so you can set up exactly how the social card will look directly from the Writing Room. For every custom type that renders a page on your website, we recommend setting up a tab in your custom type specifically for your Social Cards. Setting up a tab like the following will allow you to enter the title, description, and image to generate the Twitter Card metadata for your page or post. Now you just need to integrate the content into your template. There are many more types of social cards available. Twitter has a selection of different card formats to choose from, as well as there being cards for outlets like Facebook, Google+, LinkedIn, and others. You can go further with social cards by giving authors the ability to choose between these options. Below we provide an example of this including the JSON code for the custom type and the sample template to load them into your pages.